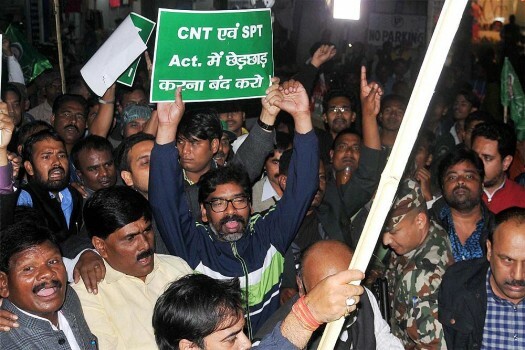 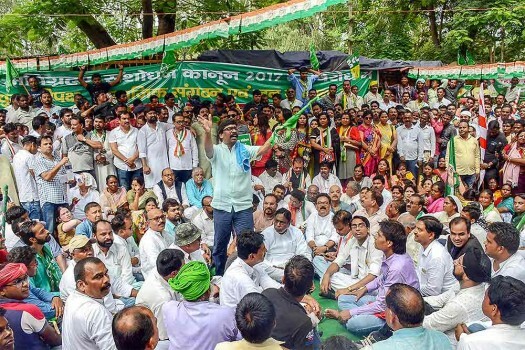 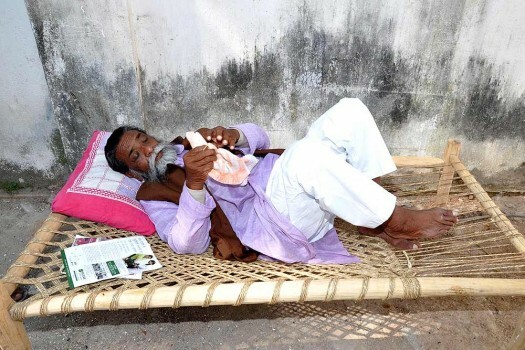 Jharkhand Mukti Morcha leader Hemant Soren raise slogans in protest against the Land Acquisition Bill passed by the state government, in Ranchi. 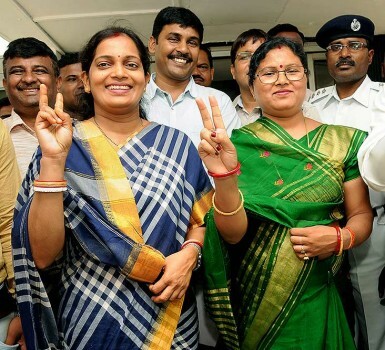 Newly elected MLAs Seema Mahato (L) of Silli and Babita Devi of Gomia flash the victory sign after their oath ceremony at Jharkhand Assembly in Ranchi. 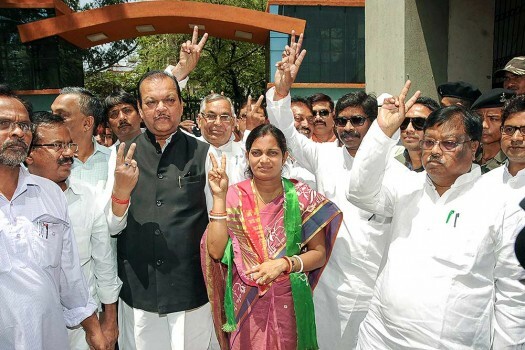 Jharkhand Mukti Morcha (JMM) candidate Seema Mahato with her husband Amit Kumar Mahato flash victory sign after winning the Silli constituency seat, in Ranchi. 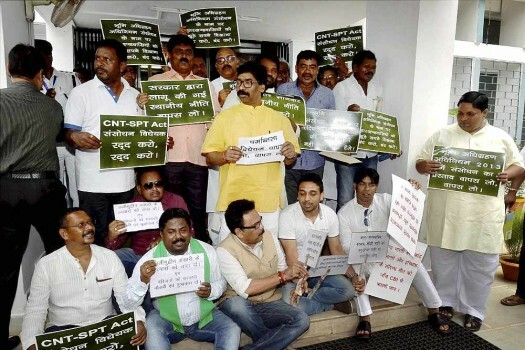 Leader of opposition Hemant Soren during a meeting with Opposition MLA's at the Assembly session specially convened to pass Goods and Services tax (GST), in Ranchi. 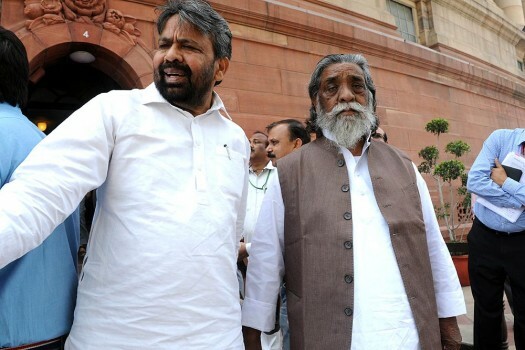 Jharkhand Mukti Morcha leader and lok sabha MP Shibu Soren outside Parliament during the budget session, in New Delhi. 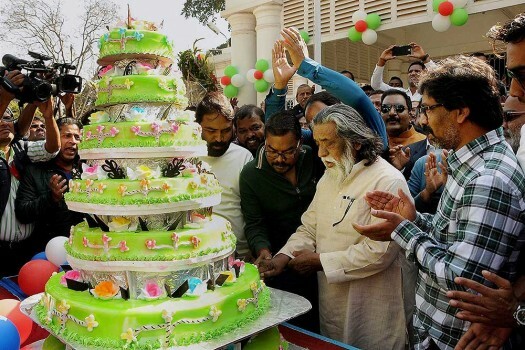 Jharkhand Mukti Morcha (JMM) Chief Shibu Soren with his son and former chief minister Hemant Soren celebrates his 73rd Birthday, in Ranchi. 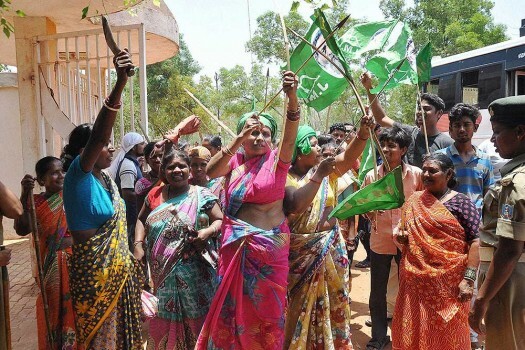 JMM supporters shout slogans holding bows and arrows during the Jharkhand bandh called by opposition parties to protest the Jharkhand government's domicile policy, in Ranchi. 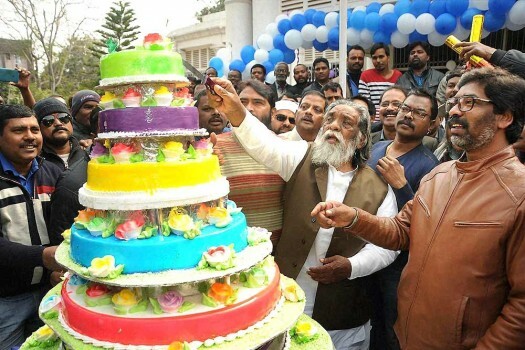 Jharkhand Mukti Mukti Morcha (JMM) chief Shibu Soren cuts a huge cake as he celebrates his 72nd birthday, in Ranchi. 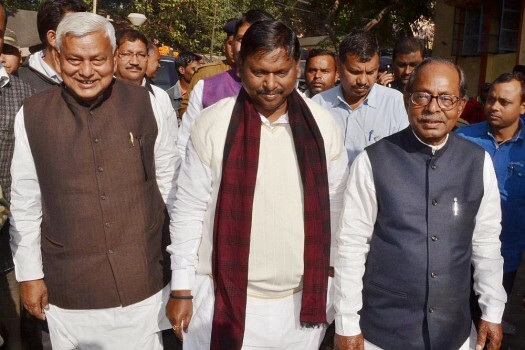 Former Jharkhand CM Arjun Munda, Dhanbad MP P N Singh and other accused appear in Dhanbad Court in connection with an election Code of Conduct case. 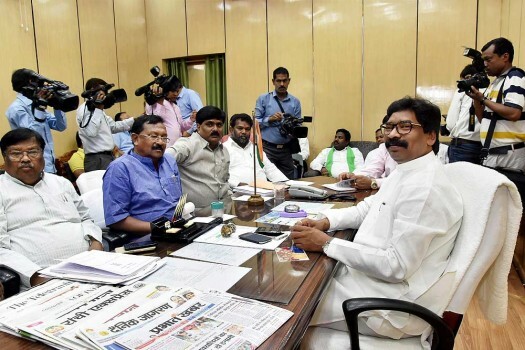 Jharkhand Chief Minister Raghubar Das seeks blessings from Jharkhand Mukti Morcha Chief and former CM Shibu Soren, in Ranchi. 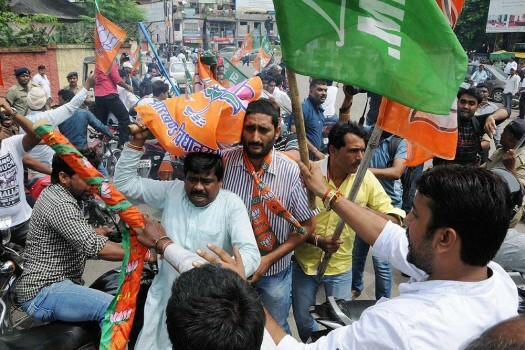 Bharatiya Janata Party (BJP) workers clash with Jharkhand Mukti Morcha (JMM) workers who showed black flags to Union Steel Minister Narendra Singh Tomar at Hinoo Chowk in Ranchi. 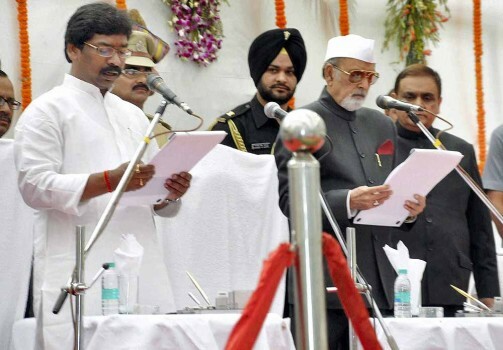 Jharkhand Governor Syed Ahmad administering oath to Jharkhand Mukti Morcha leader Hemant Soren as 9th Chief Minister of the state at Raj Bhawan in Ranchi. 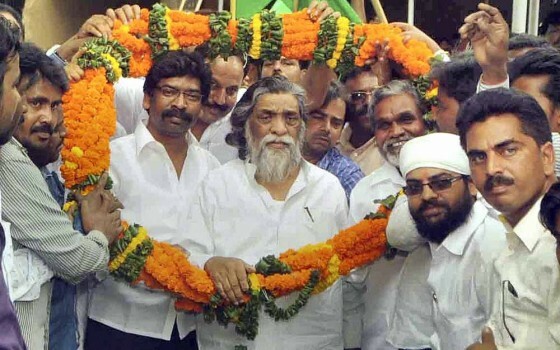 JMM chief Shibu Soren and his son & party leader Hemant Soren being garlanded by supporters in Ranchi. 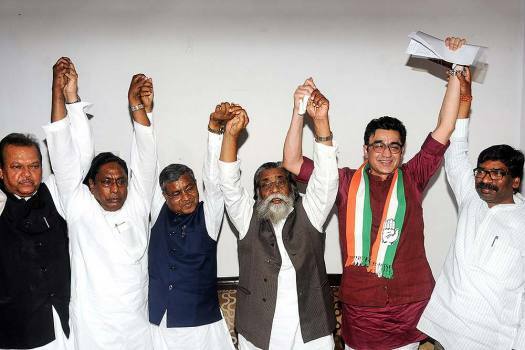 These are the states that made the 2014 BJP victory possible. 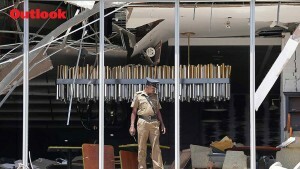 And the situation now seems volatile.